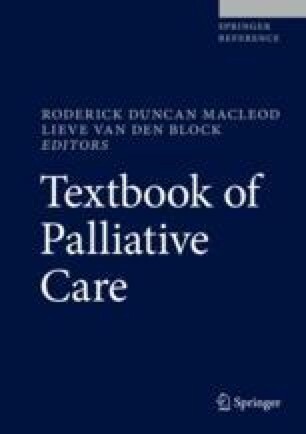 This chapter considers delirium in the context of a palliative care emergency. It reviews screening for delirium, tools to confirm the clinical diagnosis of delirium, and diagnostic challenges. It describes both the nonpharmacological and pharmacological management of delirium. It also reviews the delirium experience and associated distress. It concludes with a brief discussion of the role of palliative sedation for refractory delirium at the end of life. National Institute for Health and Care Excellence. Delirium: diagnosis, prevention and management. Clinical guideline 103. 2010. http://www.nice.org.uk/CG103. Accessed 2 May 2017. Oxford University Press. Oxford dictionary. 2017. https://en.oxforddictionaries.com/definition/medical_emergency. Accessed 22 Mar 2017. Winnipeg Regional Health Authority. WRHA policy number: 110.000.200: advance care planning – goals of care. 2011. http://www.wrha.mb.ca/index.php. Accessed 2 May 2017. World Health Organization. The ICD-10 classification of mental and behavioural disorders: clinical descriptions and diagnostic guidelines. 1992. http://www.who.int/classifications/icd/en/bluebook.pdf. Accessed 3 May 2017.